Yesterday in Odessa, Ukraine, a pro-Kiev (meaning: US-backed) mob murdered 38 anti-Kiev demonstrators by driving them into a building which they then set on fire. As the US continues its proxy onslaught on Ukraine, it serves to justify the actions of alleged mass-murderer Vladimir Putin, who to educated onlookers is starting to look more and more like a reasonable and conscientious leader: especially compared to the out-of-control American leadership. Pallas has just moved into a sesquiquadrate with Pluto which lasts for about three weeks. Mass bloodshed is to be expected during this period whenever the other three factors of the Bloodbath Formula are also fulfilled. This is a chart (time very approximate) for yesterday's atrocity. This chart very likely also applies to yesterday's massacre of Muslims in India. 2. 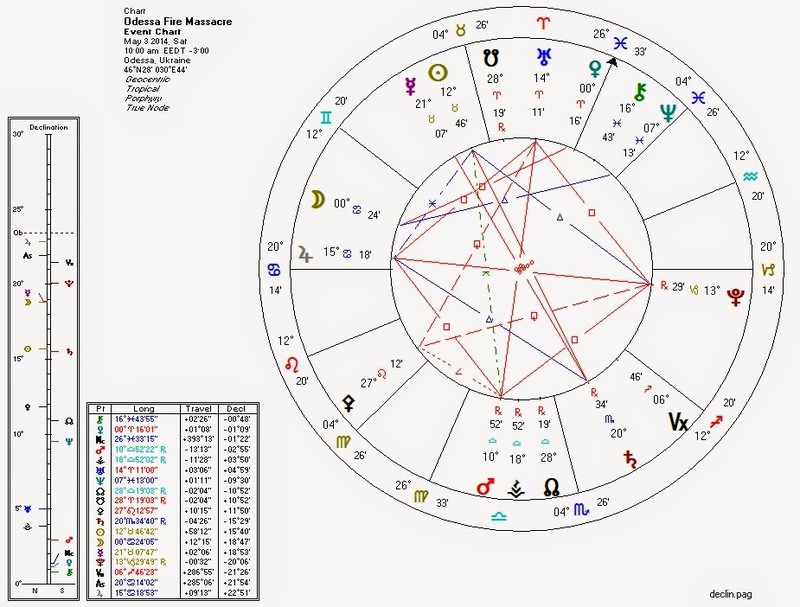 Mars, ruler of Venus, widely quincunx Neptune. 3. Mars, ruler of Venus, square Pluto. 4. Pluto quindecile Moon and rules Fourth House. When Pallas, ruler of the libertarian non-aggression principle, is compromised, the worst of humanity comes out. Joined with the other elements in the Bloodbath Formula, things sometimes turn deadly.